This thick bleach is just the job for removing stains and preventing limescale. It has also been designed to kill germs, including Salmonella, E. Coli and Listeria. The original formula will help to combat odours and as part of the essential Waitrose range it offers great value as well as quality. 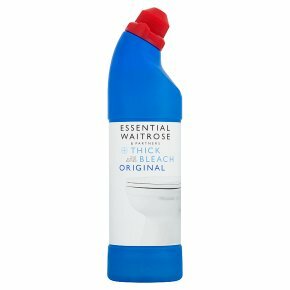 Essential Waitrose thick bleach original clings to surfaces to remove stains, prevent limescale and kills germs, including Salmonella, E.coli and Listeria. It's pleasant fragrance works to combat odours and keep surfaces fresh and clean. Safe for use by households with septic tanks. Keep out of reach of children.. May be corrosive to metals. Causes severe skin burns and eye damage.. If medical advice is needed, have product container or label at hand.. Wear protective gloves, eye and face protection. IF ON SKIN: Wash with plenty of soap and water. IF SWALLOWED: Rinse mouth. Do NOT induce vomiting. IF IN EYES: Rinse cautiously with water for several minutes. Remove contact lenses, if present and easy to do. Continue rinsing. Immediately call a POISON CENTER or doctor/physician.. Store locked up. Warning! Do not use together with other products. May release dangerous gases (chlorine).. Danger. Use only as directed. Do not transfer into any other container. Do not use on enamel or plated metal surfaces. Do not use undiluted on floors. Do not use on wool, silk, coloured fabrics, man-made fibres, leathers or garments with a special finish. Always refer to the garment label. Spillages of this product will damage some surfaces. Always wipe up spillages immediately and rinse thoroughly with clean water. Keep bottle upright in a cool, dry place. Not suitable for sterilising baby feeding equipment. Do not add directly to septic tanks.